Lee Selby says he is willing to fight domestic rival Josh Warrington in his home city of Leeds. The IBF featherweight champion beat durable Mexican Eduardo Ramirez with a unanimous points decision at London's Copperbox Arena on Saturday. The 30-year-old Welshman now expects to face mandatory challenger Warrington in April or May 2018. "If the money is at Elland Road, it makes sense to me. 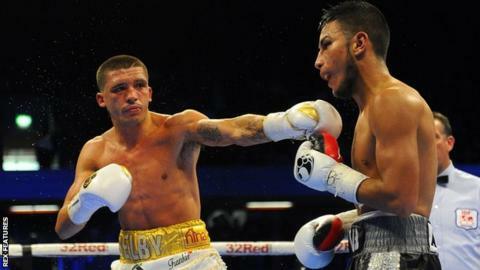 That's what it comes down to," Selby told BBC Sport Wales. Unbeaten Warrington's last fight was in Leeds at the 13,500 capacity First Direct Arena, beating Dennis Ceylan in October. But the interest in a domestic match-up with Selby would see Leeds United's Elland Road stadium - which holds close to 38,000 - as a venue. Warrington was a ringside observer at the Copperbox as Selby saw off Ramirez 119-109, 118-110, 116-112 on the scorecards. The 27-year-old and Selby have been calling out one another for a number of months. The Yorkshireman told BBC Sport that Selby is "trying to make him a villain", but Selby maintains he has said nothing that is not true and believes Warrington is merely a stepping-stone fight. "Now it will happen, Warrington is next; he's my mandatory challenger, so I will fight Josh Warrington," Selby said. "I didn't know Warrington was there [at ringside] until after the fight, but he's just another opponent to me. "If Warrington really wanted to fight me, we would have fought by now. "We proposed a date and he couldn't do it because he was getting married, but then he ended up fighting someone else on the same date! If that isn't pulling out, I don't know what is. "If I can beat him, it means a big fight with [former two-weight world champion] Carl Frampton. If I can beat him then the world is my oyster." Selby was happy with his performance against Ramirez, who came into the contest overweight and as such could not take Selby's title. However, after inflicting a first career defeat on a boxer from the same stable as another former Selby foe, three-weight world champion Fernando Montiel, Selby says he is looking to pile on a pound or two in the coming weeks. "Yeah it was a decent performance and another world championship defence, now onto the next one," he added. "He punched a little bit harder than I expected and he was a bit tougher, because I caught him with some solid shots and he just kept coming and coming. "I didn't worry about him being overweight, I just worry about myself. If the opponent comes in overweight so be it, that's on him. "That's boxing, this is becoming normal in my career. I have reached the point now that until I see the opponent on the other side of the ring, I don't believe I'm fighting! "What is nice is I can enjoy Christmas now for the first time in a few years. I have always previously been dieting, now I won't fight until April or May time."